The patient is a 75-year old man who noted a gradual swelling at the right portion of the mandible over the preceding 10 years. On exam, there was a buccal expansion at teeth 27, 28, covered by normal mucosa with crepitation on palpation. X-ray shows a multilocular radiolucent well-defined margin lesion of the ascending ramus of the mandible with a ‘‘soap bubble’’appearance. An excisional biopsy was performed. Histological sections reveal a portion of intraosseous tissue with an infiltrative neoplasm composed of anastomosing strands and cords of basaloid epithelial cells reminiscent of the dental lamina and enamel organ of odontogenesis. The cells demonstrate columnarization, cytoplasmic vacuolization, peripheral palisading and nuclear polarization away from the basement membrane. Some of the nests contain a central structure which has undergone squamous metaplasia, surrounded by the palisaded columnar ameloblastic epithelium (“stellate reticulum”). Other nests exhibit cystic degeneration. Ameloblastoma is a benign odontogenic tumor that is slow-growing but locally invasive. Ameloblastomas originate within bone and expand it as they grow, often with resorption of the roots of adjacent teeth. It presents with a painless swelling of either mandible (80% of the cases) or maxilla. Amelblastoma is the most common benign odontogenic tumor in China and Africa, and the second most common in the United States. African Americans have an overall fivefold increased risk of disease as compared to Caucasians. 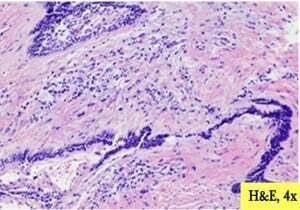 The tumor has characteristic imaging findings, however, the definitive diagnosis requires histologic evaluation. The 2005 WHO classification for ameloblastomas includes four subtypes, with the solid/multicystic being most common. Some microscopic patterns may correlate with the mutation status of these tumors. The classical histological pattern is a peripheral layer of tall columnar cells with hyperchromasia, reverse polarity of the nuclei and subnuclear vacuole formation. In the recent years, several molecular profiling studies have been published. DNA sequencing studies reported a high frequency of BRAF-V600E activating mutations in ameloblastomas located in the mandible. Cell line studies proved that the AM-1, a mandibular-derived ameloblastoma cell line harboring the BRAF-V600E mutation, was exquisitely sensitive to vemurafenib at concentrations similar to BRAFV600E-mutated melanoma and colorectal cancer cell lines. The presence of the mutation has also correlated with later recurrence, ie better prognosis. A high percentage of the BRAF-negative tumors, which usually develop in the maxilla harbor activating mutations in Smoothened (SMO), which is a part of the sonic hedgehog (SHH) pathway. The two mutations are believed to be mutually exclusive and characterize tumors at different sites. Despite its benign nature, the lesion often recurs, sometimes decades after the initial diagnosis, and a long-term follow-up is the key. The current mainstay of treatment is wide local excision with appropriate margins and immediate reconstruction. The resection can be either conservative with enucleation/curettage of the bony cavity, or radical which involves a bigger operation but yields far better outcomes. Odontogenic Tumours. Chapter 6 In: Pathology & Genetics of Head and Neck Tumours. World Health Organization Classification of Tumours; Lyon, France, IARC Press, 2006, p. 296-299. Brown NA, Betz BL. Ameloblastoma: A Review of Recent Molecular Pathogenetic Discoveries. Biomark Cancer. 2015 Oct 4;7(Suppl 2):19-24. Masthan KM, Anitha N, Krupaa J, Manikkam S. Ameloblastoma. J Pharm Bioallied Sci. 2015 Apr;7(Suppl 1):S167-70. Cabay RJ. An overview of molecular and genetic alterations in selected benign odontogenic disorders. Arch Pathol Lab Med. 2014 Jun;138(6):754-8. McClary AC, West RB, McClary AC, Pollack JR, Fischbein NJ, Holsinger CF, Sunwoo J, Colevas AD, Sirjani D.
Ameloblastoma: a clinical review and trends in management. Eur Arch Otorhinolaryngol. 2016 Jul;273(7):1649-61.